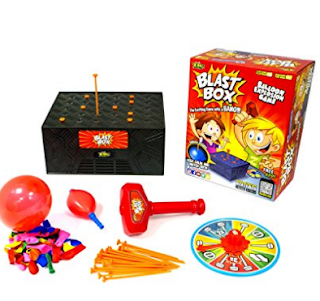 7 Kids and Us: Blast Box Balloon Explosion Game! Blast Box Balloon Explosion Game by Zing is a super fun game for all ages! My boys played this game for several hours last night, I was afraid they would run out of balloons, but they included SO many I didn't have to worry. 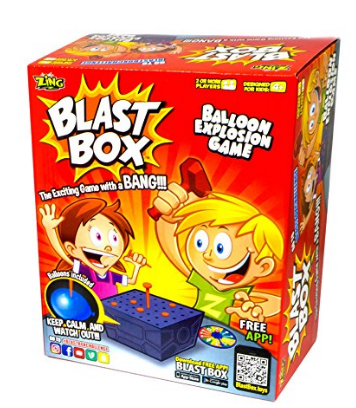 This Blast Box Game is a fun, fast paced game of skill, daring and courage. Each player takes a turn with the Balloon Blast Spinner and must drive that amount of nails into the combustible Blast Box. Be careful, one wrong move and you're out of the game. Play continues until only one player remains making them THE WINNER. Exciting game with a BANG!